I will be in Amsterdam for three nights. I can’t say that I am really very excited about food in Amsterdam, but maybe it will surprise me. Generally, I like to eat breakfast at the hostel, with a quick picnic snack and a late lunch/early dinner at a restaurant. What should I eat? Poffertjes– these are supposed to be powder sugar covered mini pancakes. Yum! Stroopwafels- waffle like thin wafers with a molasses like syrup on top. Dutch Cheese- Most of the cheese I eat in Venezuela is sort of a bland version of feta. I am looking forward to sampling different dutch cheeses- especially some aged Gouda! Broodje haring- or herring sandwich. Lightly brined herring and raw onions on sandwich bread with a side of pickles doesn’t sound like something I love, but I will give it a try! Erwtensoep (or snert): a pea soup typically eaten in winter months with a sausage and rye bread on the side. I like eating soup year round so I hope I can find it! Senses Restaurant Many people recommend trying the three course chef’s “surprise menu”. Frens Haringhandel– Said to be a good place to get the famous herring sandwich. Please comment below! Am I missing something? Should I be more excited about food in Amsterdam? 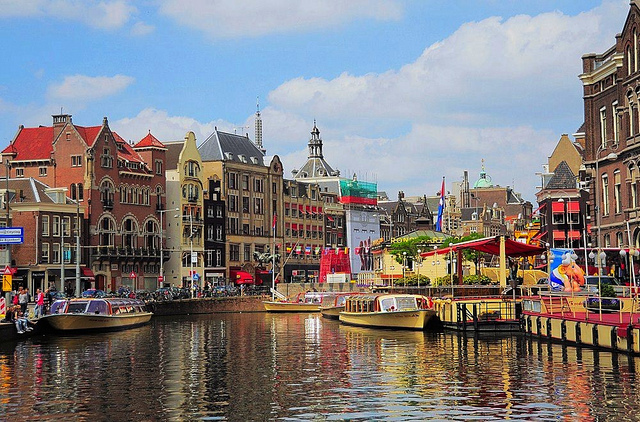 Do you have an Amsterdam foodie tip to share before I arrive on June 22nd? What about the chocolate? Haven’t I heard about the delicious dutch chocolate? Or am I misremembering? What about the apple tart? This traveling will be sleep inducing, I think! I am sure that I will need to buy bigger clothing before the end of the trip because there are so many foods I want to try! Ha!! Take a Muu-muu in case of emergency! I do plan on going to Anne Franks House, so this might be exactly what I need! Thanks! Make sure to book your Anne frank tix in advance. They sell out weeks and weeks in advance! My question is how early can I book the tickets? I tried a couple of weeks ago but I guess it was too early because nothing was available… or perhaps they were really all booked over 6 weeks in advance? Buy them online directly thru their website. They could already be sold out. I saw a note the other day on one of my local fb pages about tricks to getting them. Let me see if I can find it. My son went last week and even with a prebooked trip they had to wait. I’ll get back to you. Ok found it. This is for online. Every day at 10am, 50 tix are sold for that same day. At 12, 50 tix are sold for the next day. At 2, 50 tix are sold for the day after that. According to members of the group they tried it and it worked. So if you can’t secure tix before you go, give it a try. It can’t hurt. Upstairs Pannenkoeken (http://www.upstairspannenkoeken.nl/) was awesomely charming–but also incredibly small. Great pancakes, but be sure to make a reservation and get there early to snag one of the five tables. We were lunching at a random noodle place, struck up a conversation with the waitress, and she HIGHLY recommended The Butcher (http://www.the-butcher.com/). We tend to agree with her assertion it’s one of the coolest places in Amsterdam. Out front is a really good burger joint… but get the secret password, and behind the freezer door is an upscale bar with a world-class bartender! Definitely our favorite night in the city. If you want to do the Heineken experience, we recommend going on a Sunday–the crowds are so much lower, particularly in the evening. And since lots of other stuff is closed on Sundays, it’s a good bet. If you do the Anne Frank house, either book your tickets on a specific time stamp (generally through a third party tour) or get there EARLY. The line for the house can stretch for hours. We rented bikes while we were there for I think 7 euros/day–not bad, and we had a really reliable transportation option the whole time. And stroopwaffels are amazing. We still import them for Christmas. What great tips! The pancake place and The Butcher sound like must sees. I will see if I can find them (and the secret password). Thanks! Albert Cuyp Market will provide you with a glimpse and taste of every Dutch food known and not known not to mention the best people watching in the city. The Albert Cuyp Market is on my itinerary for sure! Thanks for the restaurant suggestion too. More snack foods: you can also buy cones of fries (frites) with mayonnaise everywhere (these come with a mini wee fork for easier eating) and bitterballen, round meat croquettes eaten with mustard, are the best accompaniment to a beer at a bruin bar. Also, for chocolate, I love Tony’s chocolonely, which is found in supermarkets. I don’t usually go for donuts nor fried things, but I might try a bite because I do like dessert in general! Those biterballen sound interesting! I will have to be on the look out for them. I love chocolate so I really appreciate that suggestion too! Why restrict yourself? There are some great Indonesian restaurants and other cuisines in Amsterdam too! If your wallet can handle it – De Kas is quite fabulous both for the 75 year old greenhouse setting and the food. I’m trying to be very budget conscious since I am already spending so much to travel around Europe for a month instead of using that money to pay off my student loans! I have seen De Kas listed a few places, but I don’t think I will go because it seems a little pricy. I have heard about the great Indonesian food there, and I will be looking into that. Thanks for the suggestions! Lots of Indo restaurants are quite affordable (by European standards) and yum! So always a good bet! Also you should try a shawarma/shoarma sandwich with yogurt sauce, its my absolute favorite! When you go into grocery stores plastic bags aren’t free like in the US, so carry your own bag or buy one from the grocery store. It may be the same in Venezuela, but you also have to bag your own groceries. The water from the tap is safe to drink and delicious here. If someone offers you ‘limonade’ its not like American lemonade. It’s a concentrated syrup mixed with water. Still tasty…but not the same. I actually like to mix the syrups with sparkling water (Bar le duc is the brand here) to make my own healthier sodas. Their Chinese food is actually Indonesian influenced, and equally yummy. Oliebollen are usually popular around the holiday season/NYE. But you should try frikandelen, bitterballen, haring (if you’re daring), kroketten, and I suggested the fresh stroopwaffels on another post. If someone offers you a shiny black piece of candy do not take it! Unless you like licorice. Licorice personally makes me want to die. But for the Dutch its like crack. Hagelslag is also synonymous with Dutch breakfasts (ontbijt). You take a piece of bread, butter it and add the hagelslag! No wonder Dutch kids are so happy. They eat chocolate for breakfast! DO BUY a jar of hazelnut spread like Nutella. Its called pasta here (hazelnoot pasta). There is this one brand that is half hazelnut half white chocolateness that I eat by the spoonful. Dutch and Americans both love peanut butter equally and you can find it in several varieties at grocery stores; but its called pindakaas (peanut cheese). Turkish bread owns my soul. The bread in Europe in general is soo good and cheap. I hope I get tired of it soon. Kibbeling are fried little fish snacks that are soo good! You can usually smell them at a market from blocks away. If I think of more I’ll post again! These are all such fabulous tips! Thanks so much. I do like black licorice so I am excited to try it. I bought some dutch chocolate hazelnut “pasta” in Curacao, and I am curious to see if it is the same. I am accustomed to bringing my own grocery bags, but I’m not very good at bagging my own stuff. It sounds so fun there! Don’t think I will eat it again…but I didn’t die. The hazelnut pasta you had in Curacao is probably the same. I couldn’t think of the brand name the other day, but its Duo Penotti. So good! Oh yeah…the best tip that I’m still struggling to adjust to is dressing in layers. And I try to never leave home without my umbrella because the weather is so unpredictable all over this tiny country.